Bring along some friends or take the family out for some great patriotic Memorial Day events. 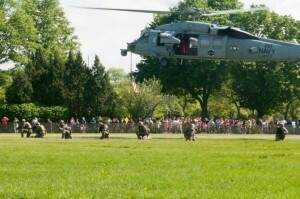 Watch two demonstrations of the U.S. Navy and Marine Core’s aircrafts landing to drop off teams for specific missions. The Navy will be landing the MH-60S helicopter and deploying members of the Explosive Ordinance Disposal Team as another MH-60S hovers over for protection. Following the demonstration the helicopters will be on display. Then stick around for the U.S. Marine demonstration and landing, which includes the MV-22 Osprey, CH-46 Sea Knight and AH-1W Cobra. As the Marines deploy, you’ll be able to see what it takes for Marines to complete an assault mission. After that, check out the aircrafts and weapons used on the battlefield. The event takes place at 10 am on Saturday, May 23, as a part of Fleet Week occurring all over the New York area. 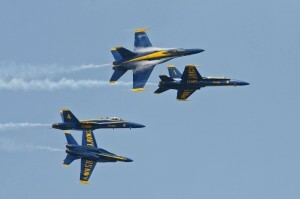 Bethpage Federal Credit Union is presenting another year of the Jones Beach Air Show on May 23 and May 24. Come early for a great spot and look to the sky to see over 10 jaw-dropping performances. For the first time since 2011, the U.S. Air Force Thunderbirds will be in attendance, so don’t blink or you might miss them! Other performances include U.S. Army Golden Knights, USMC MV-22 Osprey, U.S. Navy Parachute Team, GEICO Skytypers, Misty Blues All Women Sky Diving Team, Screamin’ Sasquatch Jet Waco Aerobatic Team, B-17 Yankee Lady, Red Bull Air Force and more. Dress warm and bring some blankets to lie down on and watch the performances. Military vehicles will also be on display throughout Jones Beach. Spend the night of Saturday, May 23 at North Hempstead Beach Park. Starting at 6:30 pm, an unforgettable commemoration will begin to honor the brave soldiers who have sacrificed their lives in battle. The night starts off with performances by the Skyline Orchestra and TUSK. Skyline Orchestra is a nine piece band who sings and plays all the most popular hits backed by horns and rhythmic collaboration. TUSK is a Fleetwood Mac cover band bringing the British blues sounds back to life. 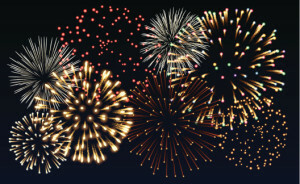 Following the performances watch an amazing display of fireworks as they fly over the harbor. Make sure you catch one of these Long Island Memorial Day events with your loved ones and friends and keep the fallen soldiers in mind. All Island Transportation hopes you stay safe this Memorial Day Weekend. Feel free to call us at a location near you or make a reservation online and we can provide transportation to your Memorial Day event.